“I’ve always liked history,” says the history and Arts and Letters Pre-Health major from Dallas, Texas. “I like that it’s multidisciplinary; I like that when you look at a past society you not only look at when and where that was but also at the cultural, religious, political, and economic context. As a student in Notre Dame’s Glynn Family Honors Program, Squiers benefits from special seminar classes and funding for a full summer of research. Her invitation to the program, she says, was a key factor in her decision to attend Notre Dame. Through the Glynn program, Squiers was able to complete her philosophy, theology, history, social science, and literature requirements with other Glynn scholars in intimate, discussion-based courses where professors encourage students to ask the “big questions,” she says. 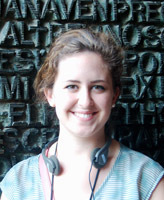 Despite the demanding academic schedule of a Glynn Scholar, Squiers is involved with a multitude of other activities at Notre Dame, including the University’s Hesburgh-Yusko Scholars program, the Department of History’s honors program, and the Kellogg International Scholars Program, where she is a research assistant on an international education project. She also finds time to volunteer at the Early Childhood Development Center. 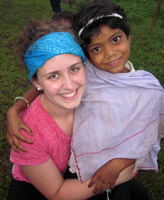 Squiers kept busy over the summers too, participating in an International Summer Service Learning Project in India through the Center for Social Concerns and shadowing pediatric oncologists at a Barcelona hospital, funded by a grant from the Nanovic Institute for European Studies. 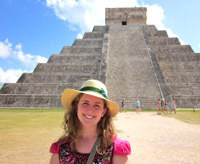 She spent the fall semester studying abroad in Puebla, Mexico, where she had the opportunity to work at a public hospital. “Learning the language and how medicine fits within the Mexican culture made the experience really unforgettable,” Squiers says. This coming summer, she plans to use her Glynn funding to conduct research at the University of Texas MD Anderson Cancer in Houston. When she returns to Notre Dame next fall, Squiers will begin work on a senior thesis that combines her two majors. Her thesis will focus on American pediatric hospitals in the 20th century, particularly with respect to the liberalization of visitation policies in children’s hospitals. Originally published by Ben Horvath at al.nd.edu on April 30, 2013.